The Rio Tinto river snakes through the Spanish countryside for 100 kilometres, a dark, blood-red stain of acid water and rusty-looking rocks that scientists love to study. Both ESA and NASA experts regularly spend weeks in the Rio Tinto, examining the life underground, and using it as a test bed to look for life on Mars. Often with them is veteran Spanish astrobiologist Ricard Amils, who has been coming to Rio Tinto for 30 years. "This is like Mars because the kind of minerals that you find here have been reported on Mars. From the geochemical and from the mineralogical point of view, this is Mars on Earth," he smiles. The scientists test the water in winter and summer to observe the microorganisms living in this vinegar-like liquid. "The water is very acidic. Around Ph 2.3. And the oxygen content goes down as we go down too. Because the bottom of the sediment is completely anoxic," explains Amils. The big scientific discovery at Rio Tinto is that the iron oxide and sulphuric acid in the water are actually produced by lifeforms deep underground living in pores in the rock, rather than by pollution from mining, as many had supposed. The life in question consists of iron-eating single-celled organisms, hundreds of metres below the surface. 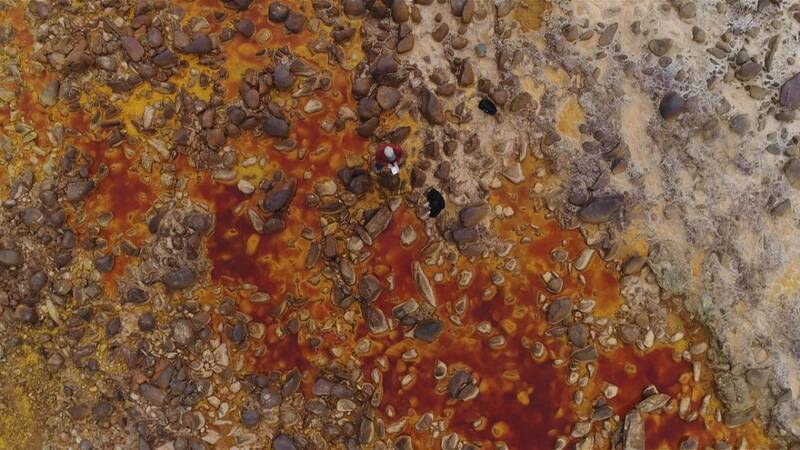 "They are in complete darkness, and the life down there doesn’t rely on light in any way," explain Cristina Escudero Parada, a PhD student from Universidad Autonoma de Madrid who has been studying the life below Rio Tinto in detail. "We could describe it as an oligotrophic environment - that means there isn’t much to eat for the microorganisms to survive. Nevertheless when we started just a few years ago to look at the subsurface we found there is really lots of life down there." The samples from the Rio Tinto are analysed at the Centre for Astrobiology in Madrid, a leading laboratory in the field. The microbes are used as a reference point to study what life could be like on other planets, and develop devices to detect it. Victor Parro, senior scientist at CAB, explains more: "We want to learn about the microbiology in the subsurface, we want to understand what microorganisms are there, and what remains they have left behind, above all because we want to test the instrumentation that we have developed to look for life on Mars. If this instrument works in these conditions, where the concentration of life is very low, we think it can also work on the red planet." Mars isn't alone in attracting attention of astrobiologists seeking life elsewhere in our solar system. Another favourite is Europa, Jupiter's moon. A decade from now Europa will be explored by ESA's JUICE spacecraft. It's a hotly anticipated mission at the Agency's astronomy base near Madrid, where we met up with scientist Mark Kidger. "The general goal of JUICE is to do an exploration, moon by moon of Jupiter, starting out with the outermost moon Calisto, then Ganymede, then Europa - the three moons that are largely made of ice and might have subsurface oceans," he says. "The idea is just to understand those moons. There are intriguing hints about them that they could be much more interesting places for life than anyone ever imagined a few years ago." Even Saturn's moon Titan has become a target for astrobiologists, ever since ESA's Huygens probe found liquid methane and ethane on its surface in 2005. Kidger tells Euronews: "Titan’s atmosphere has huge amounts of methane. Where does that come from? And one of the crazier theories that’s around is that there might be large amounts of bacteria down underneath the surface, and they are producing the methane that fills the atmosphere of Titan." Most theories now imagine life existing within the dense, salty oceans beneath the crusts of the icy moons like Europa. At CAB near Madrid researchers try to recreate those conditions, and study the chemistry of those environments. Parro shows us two examples: "We put (the sample) into this chamber and submit it very high pressure, for example up to 500 times Earth's atmosphere in this case, and up to 10,000 times our atmosphere here, which allows us to simulate the conditions in the oceans of Europa or Ganymede for example." Nobody believes there's intelligent life elsewhere our solar system. There are no little green beings, no insects or plants away from Earth. Instead, it would likely be similar to the microscopic organisms in the rock of Rio Tinto . Cristina Escudero Parada described the life forms below the surface, only visible with a microscope. "It’s not like the life that we grow in a laboratory for example where the microorganisms grow in a couple of hours. In the subsurface we’re talking about geological timescales for multiplication, it’s a completely different type of life. But they are alive, and they are doing well." The discoveries at Rio Tinto have boosted the field of astrobiology. Where only a decade ago speculation on life in our solar system was treated with scepticism, it's now no longer the case. And Amils reminds us that we shouldn't regard our own planet as necessarily unique in its ability to host life: "Earth and Mars, they are twin planets. They have the same origin, a little different distance from the Sun, but the geology is very similar. So if there is life on Earth, why shouldn't be life on Mars?" Answers to that question could come very soon. In 2020 the joint ESA-Roscosmos ExoMars mission will head to Mars, becoming the first ever mission to dig for signs of life below the surface.